Short description: Katy, maidservant at Cheadle Manor, longs to escape her narrow life but events unfold slowly in her rural village. Finally, frustrated by personal tragedy and the shackles that continue to bind her, she becomes a mechanic in the WAAC as part of the British Expeditionary Force. Through the horrors of WW1 she discovers only love brings freedom. Long description: In this heartbreaking romance feisty heroine, Katy, dreams of a better life than just being a domestic servant at Cheadle Manor. Her one attempt to escape is thwarted when her flirtation with the manor’s heir results in a scandal that shocks the local community. Jem Beagle has always loved Katy. His offer of marriage rescues her but personal tragedy divides them. Jem leaves his beloved Wiltshire to become reluctant soldier on the battlefields of The First World War. Katy is left behind, restless and alone. Lionel White, the local curate, has just returned from India bringing a dash of colour to the small village and offers Katy a window on the wider world. Katy decides she has to play her part in a world at arms and joins up as a WAAC girl. She finally breaks free from the stifling class-ridden hierarchies that bind her but the brutality of 20th century global war brings home the price she has paid for her search. 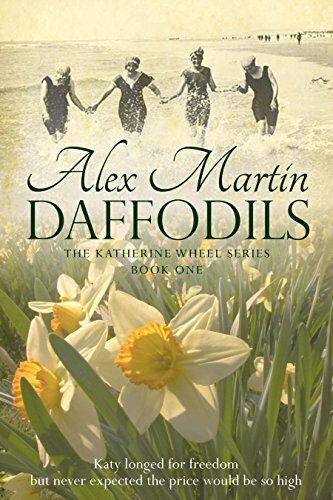 Note from the author: For fans of historical fiction, DAFFODILS is part one of a true love trilogy, The Katherine Wheel Series, is set in Wiltshire, England at the time of the First World War. It starts slowly. Life changes little in Cheadle. Petty scandals, gossip and the huge gap between the haves and those who serve them continue to dominate their small world. As I researched this era, I was drawn into the terrible tragedy of the war and so were the characters I’d created. Daffodils drags Katy and Jem out of their lives and catapults them into the wider arena of a global conflict. Most books follow what happened to the soldiers and so does Daffodils, in part. It also follows the gallant women who provided the backbone for the army, not just the nurses, but the gender defying mechanics and drivers who managed the vehicles and ambulances. I found it fascinating to discover just how much women took on and how it shook up the world they returned to, once the conflict was over. But in essence, Daffodils is a love story, whose tender heart is almost torn apart through this tumultuous time. “Absorbing, involving, unputdownable, honest, great characterisation”. Indie Book Bargains Featured Author Book of the day June 25th 2013 and was chosen to be in the first edition of the Fussy Librarian’s selection. Book Two of the Katherine Wheel Series is called Peace Lily. Find out how these characters fared after the Armistice when they entered a new, modern age. They have to carve out new lives in a changed world, having survived the war only to find new challenges they hadn’t expected when they return home. A third book, Speedwell, completes the trilogy…for now…and takes the characters into the daring arena of motor racing in the 1920’s.